Let’s, deep-dive into each element to understand application of the same and how you can use this thought process to be the shining vendor winning with Amazon! Is your entire catalog setup on Amazon as ASINs for them to consider while placing POs? Amazon uses customer demand signals to place POs. Being a customer obsessed company, they focus on input metrics of what the customer wants based on glance view, page views, what is the customer intending to buy on the site, with 3P, and offsite with other retailers. As a vendor, make sure your entire catalog is set up with Amazon for PO consideration. Remember, what you don’t have, you can’t sell! Amazon has multiple fulfillment models to cater to providing all possible selection to it’s customer – inquire and take advantage of it. Use InsightLeap’s dashboard to analyze Amazon ‘Product Sales Mix’ and compare that to your overall company product sales mix. Are there products that contribute to 80% of your overall revenue but not at Amazon? Use those data points to internally analyze and have a discussion with Amazon for 1P relationship. 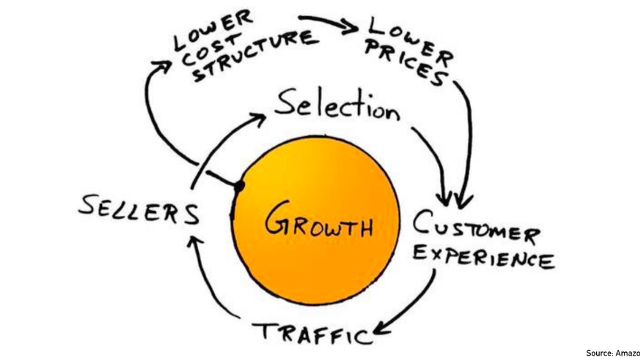 Amazon is obsessed over its customers (for real, it’s one of their core leadership principles). As a vendor you should also obsess over your common customer (buying customer). Start with the ASIN detail page. What is the customer experience (CX) of your product on the site? Does it have all possible images including lifestyle photography? Videos? Is the title descriptive enough summarizing the product? Do you have bullet points that call out key selling points? A+ content? Is your ASIN detail page search engine optimized assuring the product appears high in search results aligned to how the customers would look for your product on Google or Amazon? Basically, think of the product page as your silent salesperson. You need to arm the page with all the data that you would use to sell the product including product packaging pictures. Do they have all the information to make an informed decision? Pay close attention to customer reviews and returns to analyze what is leading to less than optimal customer experience. InsightLeap offers ASIN level monitoring which provides you a full pulse on Amazon.com product monitoring. Use the service to monitor your key products. Create an internal cadence of auditing ASIN CX every couple of months. Align that with your marketing calendar to adjust CX messaging to marketing efforts. As vendors there is a misconception that the annual vendor terms covers generating traffic. The annual vendor terms are just costs of doing business with Amazon. It pays for being on the earth’s biggest eCommerce store which inherently generates massive traffic to your products. As a result of being on Amazon you do get more customer views and hits but so are other brands. And the customer has choices. You want the customer to buy from you without additional spend. That’s the ideal state but to get there you need to work on organic and paid marketing. Focus on organic first. Think of a blog, social media pages, your own website, etc. to drive traffic to Amazon. Yes, you can drive such traffic to your company site but think for a second – where does the customer have a better chance to convert? I will bet Amazon. Drive it there. If you are doing physical marketing (newspaper, billboards etc.) you can level the playing field but if you are doing online marketing, I will suggest to stick to driving it to Amazon. After you have learned from organic marketing, allocate funds to fill in the gaps via paid. Paid marketing should be a very well-orchestrated strategy complimenting your organic efforts. This is where Amazon Marketing comes into play. In addition to Product Monitoring, InsightLeap offer Amazon Advertising as a source for data reporting (Beta). You can measure discretionary advertising spend on campaigns in a single dashboard. Not only that, you can measure how is your spend impacting overall sales and other vendor central metrics. This is where the fun begins! Sellers are a critical part of the flywheel and they feed into the selection piece. They fill the gaps in the selection. Remember, “Amazon believes in providing the largest selection of items to its customers” – this is how it all comes together. As a vendor, if you are not providing all your selection to Amazon (1P), then sellers have a chance to fill that gap. Or, if Amazon is not taking position in your ASINs directly you have an opportunity to use your network of distributors to have it on 3P. You should think of gaps in selection as opportunity. As a brand you should also be vigilant on your supply chain and continuously audit other offers on your ASINs. If you are losing a buy box, understand who is it and is that an authorized re-seller. Use InsightLeap’s Dashboard, Reports and Product Monitoring to stay on top of your key ASINs and their health. Stay in stock with Fast Track messaging to have a greater chance of winning the buy box but in instances when you lose the Buy Box understand reasons (stock, price, etc.) and the 3P seller you lost to. Overall, use the ‘flywheel’ to focus on inputs like Amazonians do and you will garner a lot more attention than any other pie chart!